Preheat oven to 160°C (325°F). Follow the basic vanilla cake recipe. Divide the cake mixture between 2 x 22cm-square lightly greased cake tins lined with non-stick baking paper and bake each cake for 1 hour and 10–15 minutes or until cooked when tested with a skewer. Cool in tins for 5 minutes before turning out onto wire racks to cool completely. To make cream cheese icing place the butter and cream cheese in the bowl of an electric mixer and beat for 8-10 minutes or until pale and creamy. Set aside. Cut both squares in half to make 4 rectangles. Cut 1 rectangle in half again to make 2 small squares. Place 2 rectangles on top of each other and secure to a cake board with some icing. Position the remaining rectangle and 1 square on the board and secure with icing. Set the remaining square aside. To decorate divide the icing into 3 equal portions. Add a few drops of food colouring to each portion and mix until colour is even, adding more until desired colour is achieved. Place 8 marshmallows+, evenly spaced, on the single rectangular cake. Place 4 marshmallows on each of the small square cakes, and place 4 marshmallows on one half of the double rectangular cake. Use a palette knife to spread the double rectangular cake with the yellow icing. 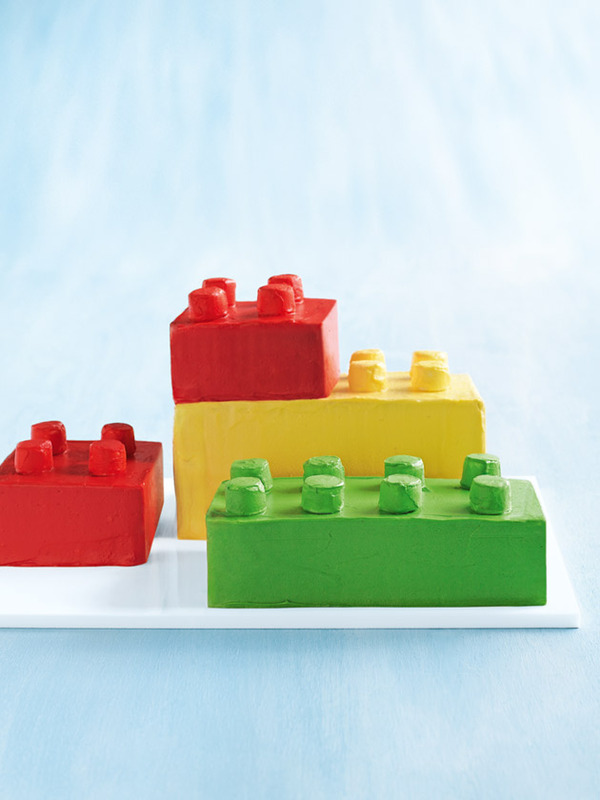 Place the remaining square block on the half of the yellow block without the marshmallows and carefully spread with red icing. Spread the remaining square cake with red icing and the remaining rectangular cake with the green icing. Serves 10–12. + Use toothpicks to secure the marshmallows to the cake, this will make it easier to ice. Be cautious with the toothpicks when serving.